Hey, sweet friends, I hope you like my new blog design! We’ve been planning for months and months for today! And finally, it’s here! My new blog design is up and ready to be viewed and used. Redesigning a blog is a long and very personal process. So many details big and small must be decided upon. Font and graphics and layout and colors just to name a few. Just the wreath alone that circles StoneGable has four colors in it that had to be chosen. But I think it was so so worth the work. And the new StoneGable has been made over with YOU in mind! Let me give you a little tour and show you around! A big thank you and shout out to my talented beyond belief blog designer Aimee from Anchored Design. Thank you for “getting me” and making my vision tangible and real! You are one-of-a-kind!!!! The first thing you might notice is that I added my name to my StoneGable header. The name of the blog is still StoneGable. But it was important to distinguish it with my name as well. I think it makes my blog more personal. Let me talk about the new color palette. The beautiful taupe, soft greige and blues were taken right from my home. Mixed with the white background, these colors really capture the warm neutrals and touches of welcoming blues you find in my home! At the very very top of the home page I added a “subscribe” bar. This is the place to add your name and email to get my daily newsletters. And if you don’t get StoneGable’s daily emails you just might want to!!! 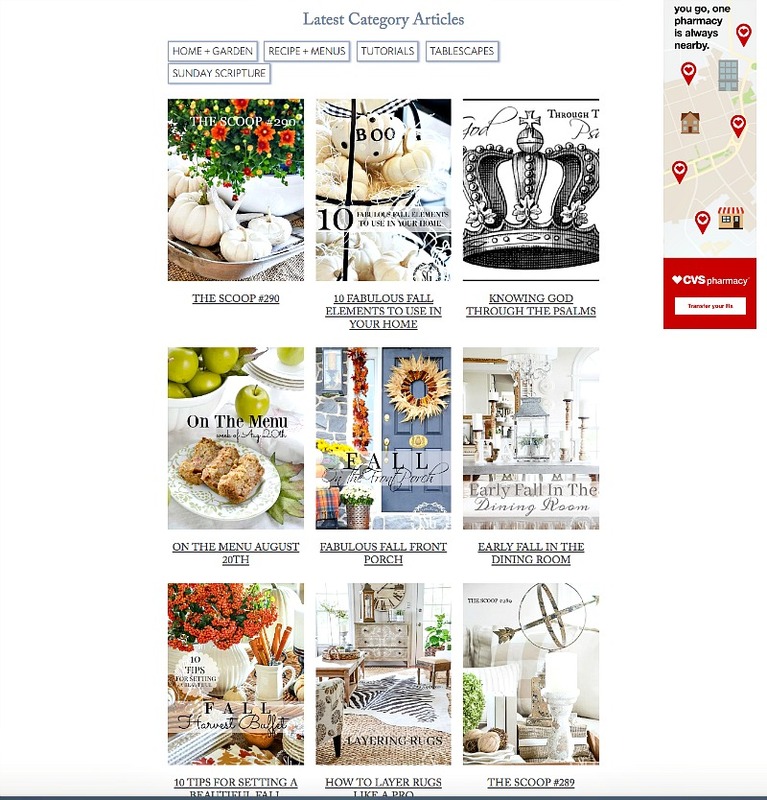 I share my daily feature post and 4 other relevant posts about home, garden, recipes, tablescapes, home decor DIY’s and seasonal decorating and projects. You can also get a link to the most current Decorating Tips And Tricks podcast too. If you are not a subscriber… now’s the time! 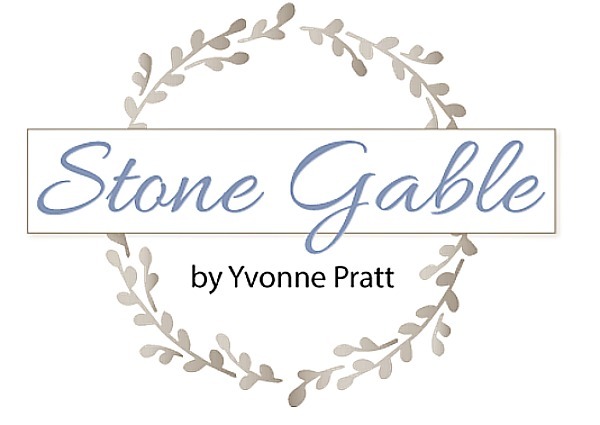 Under the StoneGable header, you will see my page topics… HOME HOME AND GARDEN RECIPE AND MENUS TUTORIALS TABLESCAPES SUNDAY SCRIPTURES PODCASTS. You can click on any of those categories and go directly to all the StoneGable posts about that topic! Let’s say you are interested in seeing StoneGable tablescapes. Instead of scrolling and scrolling through all of my posts, you can click on the TABLESCAPE tab and go directly to all StoneGable tablescapes starting with the most current ones. Simple and easy to navigate, right? Check it out!!! I am really excited about this new layout and how pretty the pages look! Now, back to the home page! The latest 6 posts are featured and with truncated text on the home page. 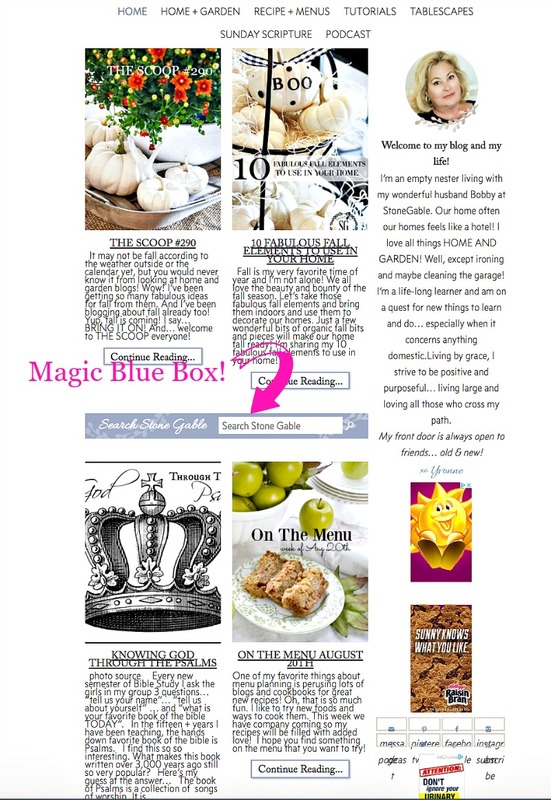 Under the first two weekly features, you will find a very important blue box! It says SEARCH STONEGABLE. This box is magical! Let’s say you are looking for StoneGable post about fall. Just type “fall” into the box and all my fall posts will populate the page. Just so easy!!!! What are you searching for on StoneGable? An apple recipe, a fall wreath, living room ideas, Thanksgiving tablescape? Use the blue SEARCH STONEGABLE BOX! 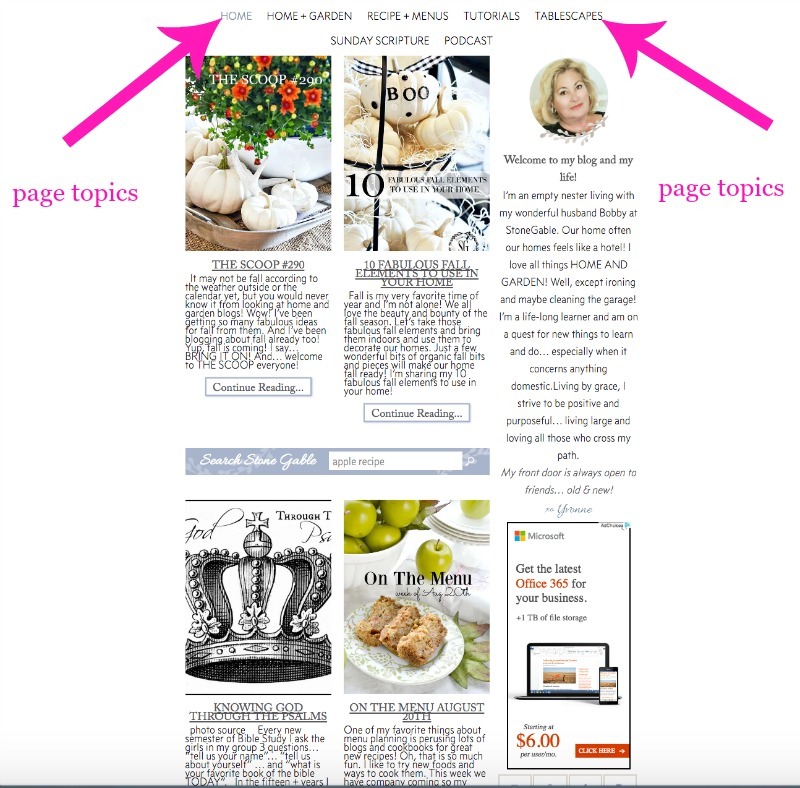 Beneath the 6 current feature post you will find the page topics again… click on them and see how they work! And below them are all my blog posts. As you scroll down the page the posts will keep on populating. 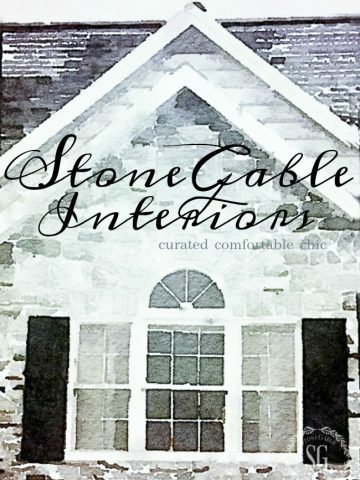 At the very bottom of the StoneGable home page you will see my latest Pinterest pins ( I LOVE Pinterest) and a link to follow me on Pinterest. I sure hope you do!!! I add more pins every day! Under my recent pins you will see these categories: HOME, ABOUT, BLOG, CONTACT, AND PRIVACY. You can see more about StoneGable in these categories! My goal was to make StoneGable fresher, cleaner, easier to use and more beautiful!!!!! And here is something I think you will like… MUCH FEWER ADS!!!! I hope you look around and familiarize yourself with the new blog design. And I know you will find it very user-friendly! YOU are the reason StoneGable exists! And YOU are the BEST!!!! 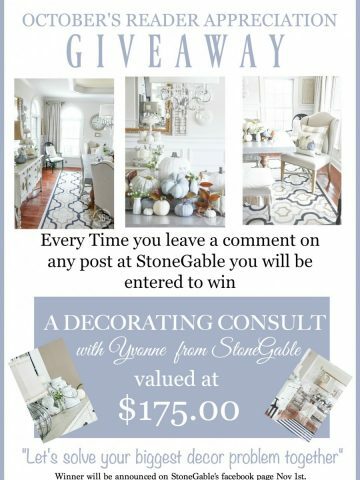 Thank you so much for reading StoneGable, following me on my social media channels and listening to Decorating Tips And Tricks. Thank you for being generous with your time, commenting and sharing, and being a part of the StoneGable family! Thank you for being the most fabulous readers and friends!!!!! I love what I do… and I love what I do because I love all of you!!!! Do not care for the new layout. Liked the old, old one much better. Seem to have more advertisements than ever instead of less. Find the header very blah and not at all exciting and inviting. Also, I have a very difficult time searching for a recipe. I try to be as exact as possible, but instead of specific recipes, my search results give me your Weekly Menus to search through. I usually give up rather than search through menus. And I love you too Carol! LOL! I hope you will be reading the content and not concentrating on the aesthetics! Thanks for your honest opinion! Hi Yvonne, I have followed you for over a year now and I am interested in potentially starting a blog myself. May I ask what blogging platform you use when writing and designing your blog? You have beautiful taste! Can you tell me the paint color that was in the Cottage Journal layout? Thank you. Hi, Nadine! The color is “Sonnet” by Benjamin Moore. Love the updates. Congrats on completing such a big project. Everything looks great/polished and accessible. Truly…what I most care for is how you make your designs/ideas easy to replicate for those of us that do not have the hundred thousand dollar house. 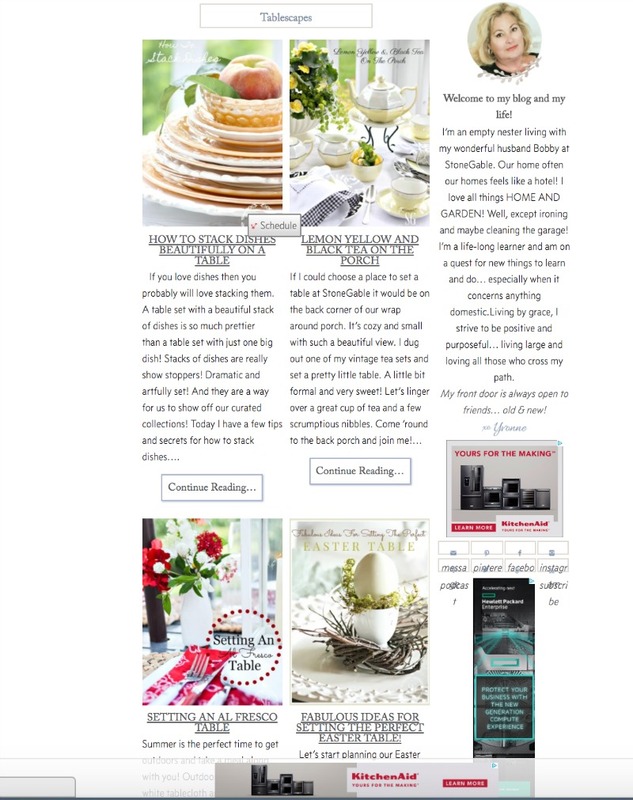 Your blog isn’t just a place to look at and wish….your blog helps me “do”! Thank you very much. Sincerely! I really do like the new design and fewer ads are appreciated, but I wish you had not removed dates from the posts. That’s how I keep track of what I have already read. Nice update. Appreciate the fewer ads…..I only see 9 on todays post. More bloggers should take your lead. And I agree that dates should be included in the posts and comments. Thank you. I recently found your blog. What a treat! I love your new design. You always have beautiful designs and posts. Yvonne.. I am from Canada and around me, not many people understand when I say that I am following blogs.. But your blog is always top of mind when someone wants to see an example.. Those new changes are SOOO you.. I really like how the website changed.. Looking forward to nice reading and nice pictures looking as well ! GOOD JOB! Thanks Michele. So nice of you to spread the word about StoneGable!!!! The update looks great, and user-friendly! Thanks, Yvonne. Thanks for taking the time and effort to try and keep things fresh on the blog. While I think things were fine the way things were I’m sure you saw where there could be some tweaking. Your New Design is Fabulous!! So nice to see fewer Ads in the middle of all the Dialogue. Your words are important Yvonne and reading with fewer interruptions is so nice!! Congratulations!! Congratulations on the new blog design – it looks amazing!! Awesome layout and love all of your organization. Thank you for making the search so easy. I always look forward to a morning with you! I missed the birds nest right away, it was one of the things that attracted me to your site in the first place! I like the updated look, it’s current, fresh and the site is easy to navigate. However, I would remove the box around Stone Gable and leave it floating on top of the wreath. Look forward to receiving your daily emails. It looks just wonderful, Yvonne! Love the colors and the new modern twist to your logo! Looking forward to exploring more! Lovely new look. But, I do miss seeing your lovely and unique Stonegable home in your header. I always look forward to opening your site – and your new ‘look’ is FABULOUS!!! Okay. now I have a typo also…it should read” like a hotel”, not line. Also, I did not want my comment posted, just wanted you to quietly know. Please remove the comment (s). Thank you. Yvonne, this is not meant for publication, just for your own information: there is an error in your new bio where you state,”Our home often our homes feels line a hotel.” I just thought you would want to know after all of the work you put into this. I do enjoy reading your blog each day. I like it! Nicely done, pretty and easy to navigate. Love the new logo, very simple but elegant just like your home. The new design looks great and seems really easy to navigate. I was not able to scroll to the bottom of the page and see your most recent pins–the page kept filling with past posts. Is there a trick to getting to the bottom of the page? Thanks! Perfection! I am amazed at your talent & grace!!! Your ‘new look’ is FANTASTIC !!! I like the headers AND the search. WoW !! Sorry but I liked the old design better! Love the new look! You have such wonderful ideas and you have made it easy to find them. I’m so happy!!! I was not able to go directly to my Pinterest board from yours anymore–not sure why–but this actually eliminates that need. I know it’s your recipe and easier to type in asparagus roll ups in search here than scrolling my own Pinterest. I like that I can reread posts so easily! I have to go play now–on this new blog site you made so that I can’t wait to try it out!!!Hugs!!! I’ve love your blog; now I’ll love it even more! Thanks for sharing your insight with us and congrats! I love the new look and feel. Much easier to navigate and find topics. I really like the organization! !I appreciate having less pop op ads. Love the new logo. However, the font is too small and faint – a reason I’ve stopped subscribing to some magazines. I agree Susan… Just got new glasses so I know it’s not my eyes… have trouble reading such light font. Really loved your blog before for its easy readability,great ideas, beautiful pictures and wonderful design tips! I know that will continue to amaze! Just hope you would consider a darker font! Thanks for listening…? I liked the old better also. I was also wondering about all the aggressive advertising on the site. I don’t remember such invasive advertisements on the old one. Sorry to be negative but know you would want to know what we are seeing. I think just like everything else the blogs are all about the $. Love the new look! It will be so easy to navigate. Thank you to Aimee for “getting” Yvonne and her readers. Absolutely Awesome! It’s beautiful and so much easier to use! I love hearing from Stonegable every day! It is so very easy to tell that you do live what you do and I am so very grateful to have found you! Many blessings! I may be overlooking it, but I no longer see the archives tab. I loved reading your blog from the beginning and seeing how your house changed over the years. It was wonderful to read the blogs in order by date. Please consider adding that feature back if it truly has been eliminated. Terrific! Especially appreciated the arrows pointing out specific areas. Well, hello Yvonne Pratt. You make your blog so attractive and easy for those of us challenged in the computer world. My grandchildren help me navigate the kinks. Thank you for all you do for your fans. Love your new blog, I commented on it yesterday. It’s more user friendly for me and today you have illustrated the change beautifully. Can’t wait to jump in and start snooping around-ha-ha!!! I love the new user friendly layout, and especially being able to find specific posts or categories. I’m often looking for a recipe, or tutorial, and this will be so much easier and less time required in finding. I just dried the three blooms from the first-year blooms on my new hydrangea, and your process worked perfectly. Now, my question, have you dried Sweet Autumn Sedum/Stonecrop before and do you have a tried-and-true process for them? I think they may look good mixed with my dried hydrangeas for fall. I love your new blog design! Very easy to use and I love the colors! Yvonne, the new design looks beautiful. As soon as I saw the colors I thought, “Oh, this reminds me of her house” – before I even read that it was intentional!! I don’t know if you changed the “welcome” portion with your photo on the right hand side of the page or if it was always this way, but there are some extra words in there – looks like a typo. Not being critical – I just know you’d want to have it right. I’m looking forward to using the new site! Love that it is easy to navigate. But best of all I’m happy to hear you are writing a book! Such good news and I look forward to it! Thank you for walking us through your blog and it’s new functionality! It’s very clean and crisp looking. I appreciate the black font and lettering size as well. (I hate straining to read some blogs when they use the lighter gray colored, small lettering.) Anyway….it will continue to be a favorite of mine I know! Yvonne!!! This new website format is The Classiest and at the same time the easier and most efficient to navigate of any of the websites I use!!! You have discovered the magic formula for making your home page practical, informative, and beautiful. And yes, I love your pretty new logo that mirrors the colors and the classy feeling of your home! Great job!!!! Love it, however; when I pull it up on my computer your second sentence in your bio repeats the first couple of words in the same sentence. It probably is a glitch in my search engine. I, too, am a life long learner. I think it may drive my husband crazy at times because I’m always rearranging and honing my skills in the areas of crafting and homemaking I love. Most of the time that equals $$$. As a former computer teacher, I know how much time it takes to get things ‘just right.’ It is an ever evolving process that changes when we refine , not only our skills, but also ourselves. Thanks for your hours and hours and hours of dedication. Beautiful and so easy to navigate! I loved your old blog site but I really love the way you have designed this one. It is easier to see everything and the header bar is so helpful. I look forward to seeing what you post every day. ! Love, love your new blog design. It’s so clean, informative, easier to navigate and adds your personal touch. It is a fresh new look. It is evident you spent a lot of time with this and your love shines through. I really appreciate the search bar! Beautiful Yvonne! 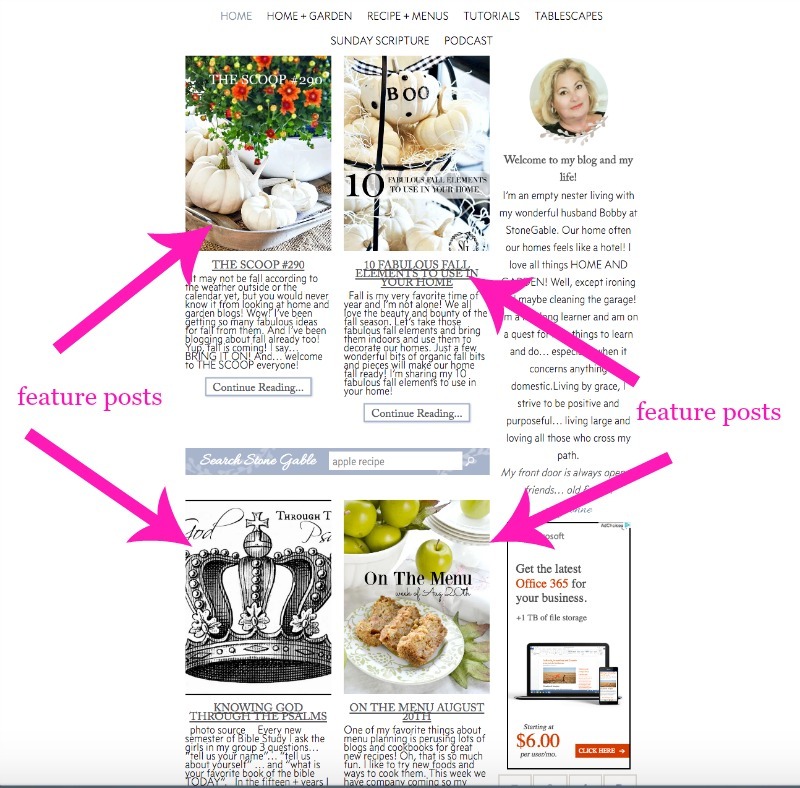 Wonderful and exciting new features to an already pretty perfect blog! Thank you for all you do for us and how you do it. Hi Gail! I just LOVE all of you and it is my great pleasure! Your blog’s new design is amazing. I love the new circle wreath with both your blog name and personal name, love how you organized the page, and love the blog’s color palette. The ads are much better placed. I had a hard time reading and viewing the photos on the previous layout because ads popped up to cover the photo. Excellent job, ROCK STAR! An A+!!!!!!! Judith what a compliment!!!! You have such impeccable taste and an eye for detail! Thank you so so much! Love the fresh new look, that there are fewer ads and that it’s easier to get around. The search boxes are really great but would still like to see archives and dates – those things contribute as well to getting the most from your blog. I keep returning for the content, photos and inspiration. Thank you for putting StoneGable out here for us! LOVE the new design! The search bar across the bottom is awesome and it’s going to save me a lot of time when I’m looking for something specific. You have excellent taste, a beautiful home, and I always look forward to your posts. Blessings to you and your family. Love the search feature and love your new blog. I have learned so much from your blog and my home it more beautiful for it. I listed to the Tips and Tricks pod cast. My husband is a closet listen listener. He always seems to have something to do close by when I listen. I hear him laugh at some of the comments. Thank you again. We love our “closet listeners”! Love it Yvonne! It’s fresh, clean and crisp! I loved the previous layout too but this update is great. So easy to navigate and the magic blue bar, I LOVE that! So many times I have made your Strawberry Hand Pies, and many other recipes, and each time I would go back through all of the “On the Menu ” post and try to remember which one had the Strawberry Hand Pies in it. This makes it soooo much easier! I love your blog and appreciate all of your hard work that goes in to making this such a great place to come for ideas and inspiration! Thank you! Oh, and love fewer ads!! I’m thrilled StoneGable will be easier for you to navigate now! Loved the old style and the new style looks so user friendly. The content of your blog is what keeps me coming back. Thanks for all the great inspiration! Love the new fresh look! Your new design is stunning, Yvonne! Putting the search box in a more prominent place is a great idea! LOVE THE NEW LOOK! AND LOVE YOUR BLOG! ALWAYS EASY, FUN, AND GREAT IDEAS AND RECIPE’S! TO YOUR SUCCESS ….CHEERS! I really like your updated design! The original was great too but we need to give in to new and exciting ventures!! So glad you chose to do just that!!! It is evident that much thought and effort went into the changes. I do not know how you managed to have fewer advertisers, but you deserve a BIG “thank you”!!! Lovely! Your new look is so professional and easy to use.As always the content is outstanding. Keep up the good work . Your work makes your blog the best! Beautiful job, Yvonne! It really reflects the feel of your blog! The new layout looks fresh and new. I liked the old one also but I’m sure I’ll get used to this one. Please check your “Welcome to my blog and my life” section for a typo. It says, …”our home often our homes feels like…” I think the words “our homes” was meant to be deleted so it would read, “…our home often feels like….” I’m not being critical, but I’m sure after so much work on the new layout, the perfectionist in you would want it to read correctly. Please excuse an old editor and proofreader’s obsession. OMGoodness it works now!!!! Now I can say, your new blog looks beautiful! Love the colors, they are definitely yo! Miss you!!!! The only thing I’m missing is the archives section. I like looking back at certain months and years but can’t now. I also noticed there are no dates on posts anymore. Weren’t we able to search before and have everything come up in that subject area? I do love less ads though! No matter what your blog design looks like it’s still one of my favorites that I check every day! Yvonne … Bravo! It looks spectacular! Having worked on my own business logo/blog/website in the past I know how personal and overwhelming it can be … the layout, the colors, the details … and as you say … right down to the 4 shades in the wreath, the size of those leaves, the font, the color of the font. It’s like giving birth to a baby! Well your “baby” is beautiful! 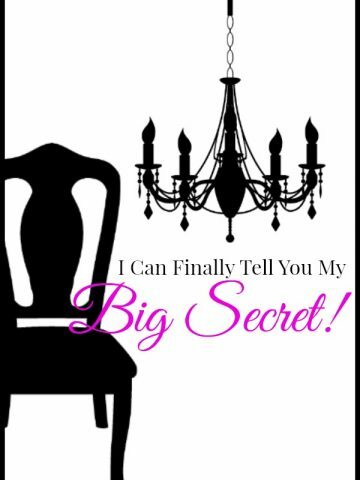 Having become an avid daily reader of your blog and a nightly listener of your Decorating Tips and Tricks podcast (on the oh too many nights when I am wide-eyed at 2am! 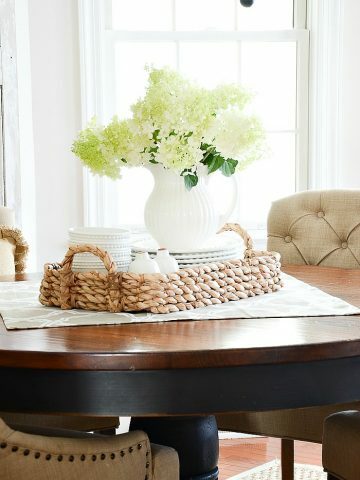 ), l love your warm and welcoming Southern Style. And I feel your new design so expresses your warm and friendly personality. It’s just lovely! Best of all … I can get in there and start searching ’til my heart is content! Just grabbed my morning coffee and off I go! ? It all looks great, but I’m especially glad you added your name. If I had run into you at the Piggly Wiggly, I would have said, “Hello Miss Stone Gable!” I’ve loved the name Yvonne since watching Batman on TV and seeing the actress Yvonne Craig play my favorite . . . Batgirl! I guess you didn’t think through that angle during blog planning, did you? Love the new look and ease of finding different topics. Thanks Yvonne. Your blog is my favorite and the first one I go to in the morning to read with my coffee. It looks fabulous and so easy to navigate!! Well done!! Looks great Yvonne! The colors and layout are very appealing. Love your Blog! I love your new look Yvonne! The color choices of your logo are fresh and calming. I LOVE your new search bar!! This will definitely save time when I want to refer back to something I read in your daily newsletter, it’s much easier to find it!! I love it, Yvonne! Beautiful and user friendly. You do such a nice job with everything you do! ? Thank you for making it so much easier to get around your site. There are many post that are wonderful to go back and look at again!!! I love your new layout. I especially like the search tool. As I read through your description of the new blog, I could see that everything you did was with your readers in mind. Thank you! I love the new blog design! I also love that I can just search “Fall” and see posts about that subject. I look up some recipes as well, like your potato salad that I made last weekend. Love the new design and layout Yvonne. Of course I enjoyed the other one too but sometimes it’s just time for a change. Simplicity wrapped in elegance! Love it, Yvonne. After all, it’s about your posts, right? (sorry advertisers). Yvonne, looking good!! Love the new look. I love your blog and look forward to it every day, as well as your podcast. Thanks for sharing and always inspiring me. Enjoy your day. Loved the old. Love the new. It’s always a joy, visiting you! The care and details of your home designs also show through on your new blog! I love the new colors, wreath (very classic) and especially the new search options. One tiny suggestion, under the section”You might also like”, could you add a date reference for that posting? It’s nice to know when that post was published. Thanks for all the ideas you have given me over the years, I’ve stopped counting the number of wreaths and crafts I’ve made, and it’s a good thing I still have enough storage space! I love the way you can search for different topicd..really cool feature… ?I must admit I do miss seeing the cute blue nest…but you cant keep everything..Our world is all about change…? Yuvonne looks great, what an exciting time for you! I love your posts and your new changes will be great to explore all your tips and tricks and all your lovely photos. Very nice updated design! I love that I can find older posts without searching or scrolling around! I love the blog and the substance of your work. Heart warming and inspirational. I like this layout as well. Just lovely! It is so nice to have the “search” feature and I really like how you organized things. Congrats on a beautiful project. I love the new layout! Very user friendly. I can’t wait to explore it. I love the new design. It’s clean and fresh, which shows off your photos beautifully! Just fantastic – Look forward to exploring the new site. About advertisements, actually I tune them out, just as I do when I am watching television. I hope you still recoup some of the dollars that goes into something like this. Love you and keep up the fabulous work. Please !! You are a smart girl Carol!!!! Love the new layout. Tastefully done with minimal visual overload with advertising. Job well done! So glad you like it Kathy! Love the fresh new look Yvonne & I especially like being able to see your recent pins at the bottom! And finally a search feature that has larger pics to go along with the post(so many include a tiny pic & when I’m looking for something specific I end up clicking on way to many posts before I find the exact one I want! )..hope that made sense. Thank you for sharing & inspiring! I love the new header…your blog is the best! I have not received the new format. I love your blog. Thank you for caring about all of us “decorators”.